How to Recover Deleted Photos from Olympus Camera with IUWEshare Digital Camera Photo Recovery(Win/Mac). 1. Accidental format: If you accidentally format memory card on your Olympus camera then you may end up with losing all memorable pictures from it. Or if you press delete option by mistake while previewing pictures then also it may cause loss of files because when you delete a file from camera then it directly gets deleted as camera or memory card do not have Recycle Bin to store files temporarily so that you can restore them back. Sometimes while formatting, you get an error if there is some kind of interruption in the process. This tool is perfectly capable of retrieving pictures after format error also. 2. Third Party Software: The pictures from Olympus camera memory card may get deleted by third party application like Antivirus scanning program. Antivirus program may delete images from the memory card that are severely infected by virus and could not be repaired by it so deletes the file along with the virus. 3. Using cut & paste option: While your camera is connected via memory card or USB cable to your system and if you are transferring files from your camera to your system using "Cut + Paste" option & you remove it suddenly then your images disappears because when you use this option then file is already removed from the source location to be moved to destined location so sudden removal leads to loss of files. 4. Power surges, switching off the camera or computer while transferring photos from Olympus camera's memory card to the computer may erase photos that are being transferred. 5. Clicking pictures when the camera is displaying low on battery warning and using same memory card on different digital gadgets may also lead to loss of photos. 6. Insert the camera memory card to our computer or laptop to backup all the precious photos in case of emergency, the system cannot recognize your camera memory card properly and asks you to format it. You follow the instruction without thinking too much and format your Olympus camera memory card, the result is all your valuable digital photos are deleted. 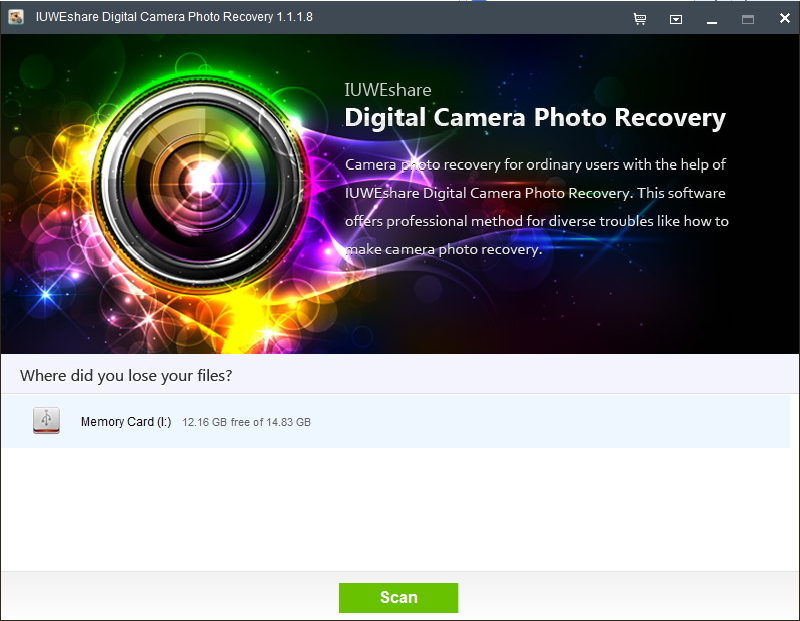 IUWEshare Digital Camera Photo Recovery(Win/Mac) can help users recover deleted photos like JPG, CRW, RAF, RDV, X3F, PCX, OCI, RAW, SIT, COW, PSP, TIF (ARW, CR2, DCR, NEF, PEF, SR2, WDP), etc. from Olympus cameras like Olympus OM-D E-M5, Tough TG-1, Tough TG-820, PEN E-PL3, PEN EP-3, PEN E-P5, and more. Connect your Olympus digital camera to your computer. Note that you should not attempt to use the device to take more photos before performing photo recovery from Olympus digital camera. 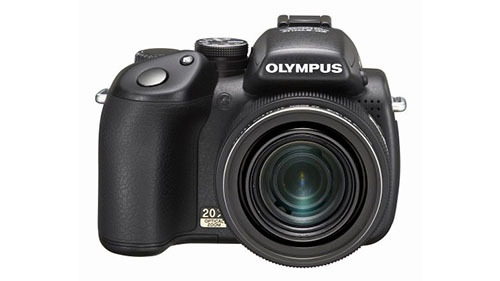 Select Olympus camera or its memory card as the target disk, and then click "Scan Now". The software will automatically start to scan photos from Olympus camera. After scanning you will find a list of recoverable files and you are allowed to preview the scanned photos. Select the photos you want to recover and click on "Recover". Olympus Stylus XZ-10, Stylus TG-2, Stylus SH-50, Stylus TG-830, Stylus TG-630, Stylus SZ-16, Stylus SZ-15, Stylus XZ-2, Stylus TG-625, Stylus VH-515, Stylus VH-410, Stylus SP-820UZ, SP-720UZ, SZ-14 DX, VH-510, OM-D, Tough TG-820/TG-62, SZ-14, VG-170, SP-620UZ, Tough TG-320, VH-210, SP-810UZ, SH-21, SZ-11, VG-145, etc.